1) Finger and hand shape analysis: This can reveal some major personality characteristics. 2) Detailed hand analysis: Sharp images of the palm and hand is required. You will need a powerful camera with a close-up setting or scanned images or actual prints. 3) Fingerprint Analysis: Either photos, scanned fingerprints or actual prints via a stamp pad are required. Please do not ask me to read hands for free as I spend hours studying a hand, and cannot do it for free. Also, I get several requests for free analysis every week, another reason why I cannot do it for free. Hi Amrita. Yes I have some recent photo prints of your hand. And whats more, I have some I took 25 years ago!! So I can do a good comparison. Give me some time. I need to set this blog up and running properly first. Although its been set up I need to post more regularly because I am finding it hard to appear in Google quickly. It takes a long time to do the hand of a celebrity because pictures are not clear and I need to search the images, often scores and scores of them for the right one and then try and decipher. Its difficult and time consuming. Nita... It would be really nice if you could have a look at these and suggest. I am right handed. Let me know if you need more photos or any information. Thanks in advance. Finally, request you not to publish the photos with my name. You can send me an email at chiranjibmazumdar1@gmail.com. It is the second part of this post on which you have commented. That will give you a better idea of the kind of hand photos I require. I do not publish hand photos of private readings. 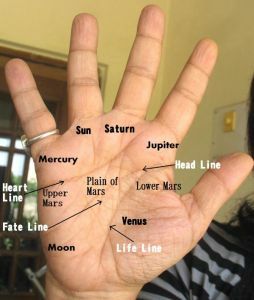 Thanks for this blog as there are very few scientific blogs on palmistry.You are correct on all counts as per my experiences in palmistry too(Although I am interested in the science for the past 15 years only).However I partially agree to point no. 10.I have seen people settling in foreign land where the life line occasionally sweeps deep into the mount of moon.May not be always true .I was amazed to see hands of a few who late confirmed to have settled in a foreign country. Hemanga, The basics of any science is that the mark is right each and every time and so it is with Palmistry. If you have seen a particular mark being right only some of the time it means that it cannot be used to predict what you say. In fact I know someone with that sign who has not traveled abroad at all. The Mount of Moon gives a person restlessness, thats all and often people with this sign do travel if they get the opportunity. I was travelling from Mumbai to Ghandhinagar.One average looking gentleman was one of the many travelers in my AC III tier compartment.By instinct I got to look at his hands.There was a wide sweep of the lifeline that ended on the moon mount .Although curious but I never asked about his whereabouts.After a few hours past the gentleman told the fellow group members that he had settled in South Africa and has traveled throughout Europe.Married and separated in Europe and now looking for a prospective bride in his hometown somewhere in Gujarat.I was truly amazed at the truth of a single sign.I agree that it may not be true always but at it conforms some time. And yes one more thing. Many people without this sign travel all over the place. That is also something to consider. Hi Amin. I am sure there are ways to pay as paypal is not the only way. I know paypal is blocked in Iran. If you have some relative or friend outside Iran they can pay via paypal. My fees are nominal considering the amount I spend studying hands. I get many requests to read hands for free (4-5 a week) and if I oblige I will have to just do that and nothing else. The reasons vary from "I am jobless" or "I am in trouble" or "I want to do this secretly"and I am sure they are genuine reasons but I cannot oblige. I sympathise with all of these people, but I need to take money, even if it is a little. This is the way I am earning a living and I spend hours reading a hand. When it comes to your hands, all I can say is that if your left and right hands are different, you have carved out a different path for yourself than what your destiny was. Best of luck Amin. So please help how I contact you for my palm reading..? How you meet your partner, whether your parents introduce you or your friends, this can never be seen on the hand. If you still want to contact me for a paid reading, you will find my email id on this website, under the About Me, section.